Time for another one of Movie Rob’s Genre Grandeur. 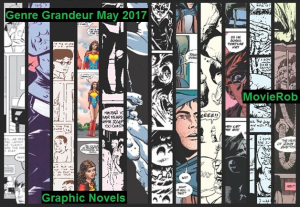 May’s the month of graphic novels adaptations to movies. Feel free to head over and check out all the cool entries. Here’s mine. Welcome to Ghost World. I have admitted before and I’ll admit again, blogging is something I love doing but can’t keep up with. It’s never easy, especially for an ADD (attention deficit disorder) like me. Glad to say that MovieRob’s Genre Grandeur is one thing that always gets me going back to reviewing movies and writing. Thanks Rob for keeping me in the loop. Next Post The Text Message That Ruined it All! Tnx again for participating as always!